Most musicians are lucky to be in one successful band. A few become members of two successful bands. John Wetton has been a member of numerous successful bands. His career started with Mogul Thrash, before moving onto Family, King Crimson and Uriah Heep. He then joined prog rock supergroup UK, who released two critically acclaimed albums. Next stop for John Wetton was Wishbone Ash, before he joined another prog rock supergroup Asia. Their first two albums sold in excess of nine million copies. John Wetton was living the dream. However, he was working harder than ever. By the early eighties, John Wetton was still working as a session musician. The great and good of music had John’s number. He worked with Roxy Music, Brian Ferry, Tony Banks, Phil Manzanera, Roger Chapman and members of E.L.P., Genesis and Yes. It seemed John had an insatiable appetite for music. So, it’s no surprise that in 1980, he embarked upon a solo career. Caught In The Crossfire, which was released in 1980, was John Wetton’s debut solo album. Further albums would follow over the next thirty-two years. It was as if when John had time, he would return to his solo career. These albums were welcome releases, from a musical innovator. 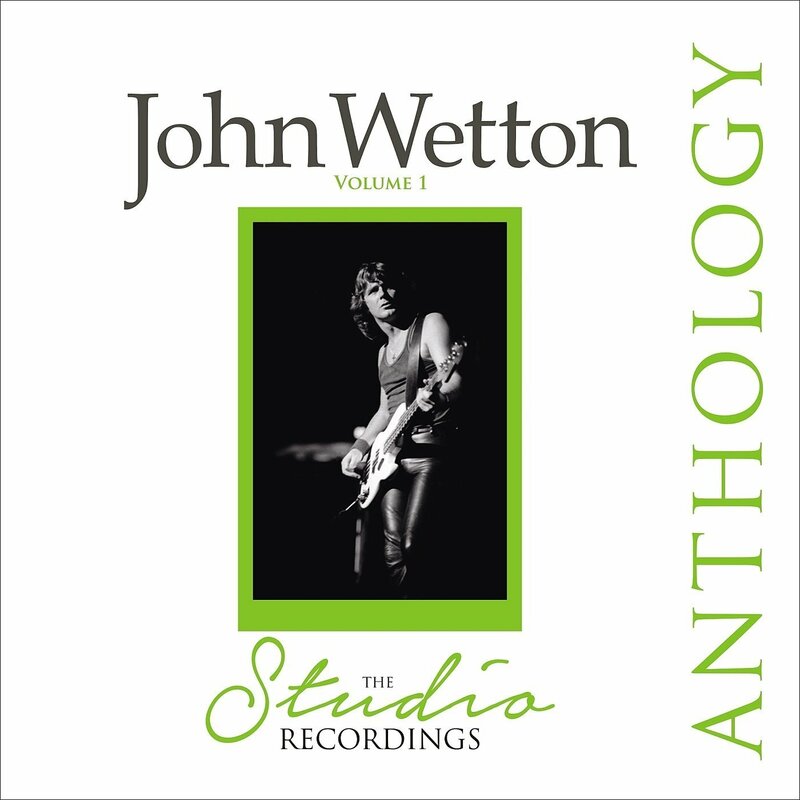 Thirty-two tracks from John’s solo albums features on the recently released Anthology-The Studio Recordings Volume 1. It was recently on the Primary Purpose label, and and is an introduction to John Wetton’s solo work. It took nine years before John Wetton got round to recording his debut album, Caught In The Crossfire. By then, John Wetton was almost a musical veteran. The previous nine years had been a whirlwind. It was a long way from John’s early days in Bournemouth. John Wetton served his musical apprenticeship in Bournemouth, where he grew up. That’s where he first met Richard Palmer-Jones. They were members of The Corvettes, The Palmer-James Group, Tetrad, and Ginger Man. After that, John Wetton joined Mogul Thrash. That’s where he made his breakthrough. Mogul Thrash were a prog rock band, who had evolved out of Brotherhood. They released their debut single Sleeping in the Kitchen in 1970. Then a year later, Mogul Thrash released their eponymous debut album in 1971. It was produced by Steampacket founder Brian Auger. On its release, Mogul Thrash was well received by critics. The future looked bright for Mogul Thrash. Sadly, that wasn’t the case. John Wetton fitted the bill. Not only could he play bass, but he was a guitarist and vocalist. So, the multitalented twenty-two year old joined Family. He played on their next two albums. Fearless, Family’s fifth album, was released on 29th October 1971. This marked John Wetton’s Family debut. He played bass, guitars, and keyboards. Family were almost getting three musicians for the price of one. He would more than play his part in Fearless’ sound and success. King Crimson incorporated different instruments, including percussion and African mbira. They moved away from their jazz sound, to a fusion of prog rock and experimental music on what became Larks’ Tongues In Aspic. On its release in October 1974, Red reached just number forty-five in the UK and number sixty-six in the US Billboard 200. Critics hailed Red as an innovative album. There are obvious similarities with Larks’ Tongues In Aspic and Starless and Bible Black in sound and quality. One change was the lack of the acoustic guitars that featured on previous albums. With its fusion of prog rock and classic music, Red proved to be a hugely influential and innovative album. Sadly, it was the last King Crimson studio album to feature John Wetton. UK had been recorded between December 1977 and January 1978. It was released in March 1978. Although critics gave UK glowing reviews, referring to the music as innovative and progressive, UK passed record buyers by. The four members of UK were going to give up. The nihilist sound of punk and post punk was polluting the airwaves. Many critics were little more than cheerleaders for the talentless punks. It truly was the great rock ’n’ roll swindle. Its victims were talented prog rock groups who punks referred to as dinosaurs. However, little did they realise that in three years time, John Wetton would have the last laugh. John Wetton-Caught In The Crossfire. On its release in 1980, Caught In The Crossfire was well received by critics. Although quite different from his work with Family, King Crimson and Uriah Heep, it showed John’s versatility and ability to create ambitious and innovative music. Three of Caught In The Crossfire’s highlights were the title-track, Woman and Cold Is The Night. Fittingly, they feature Anthology-The Studio Recordings Volume 1. These tracks are a tantalising taste of what John Wetton was capable of as a solo artist. Record buyers awaited John’s sophomore album. It would be a long time coming. Following Astra, John Wetton left Asia. While they enjoyed a degree of commercial success, Asia never reached the same heights. The lineup of Asia with John, Steve Howe, Geoff Downes and Carl Palmer proved to be the classic lineup of Asia. We wouldn’t see their likes again until 2008s Phoenix. By then, John Wetton was enjoying a successful solo career. Fourteen years after John Wetton released his debut solo album Caught In The Crossfire, he returned with his sophomore album Battle Lines. It marked the return of a musical innovator. Throughout his career, John had been an innovator. That was the case on Battle Lines. He made good use of the new technology that had become available. Keyboard parts were programmed and samples were used to create orchestral arrangements. They feature on Hold Me Now, Battle Lines and You’re Not The Only One, which all feature on Anthology-The Studio Recordings Volume 1. John also programmed parts of Right Where I Want To Be and Walking On Air, where he also deploys synths. However, John hadn’t turned his back on traditional instruments. He uses guitars on several tracks, including Cold Is the Night and the acoustic version of Battle Lines. With its mixture of technology and traditional instruments, Battle Lines was a captivating album. Battle Lines veers between beautiful and elegiac, to dramatic and innovative. Genres melted into one. Elements of folk, folk rock, prog rock and rock can be heard, as John and his small, talented band make a welcome return on Battle Lines. After Battle Lines, John continued to concentrate on his solo career. He released Chasing The Dragon in 1995. However, none of the tracks from Chasing The Dragon feature on Anthology-The Studio Recordings Volume 1. The next studio album that features on Anthology-The Studio Recordings Volume 1, is Arkangel. Given Arkangel is one of John Wetton’s finest solo albums, it’s fitting that seven tracks from Arkangel feature on Anthology-The Studio Recordings Volume 1. One of the most beautiful is The Circle Of St Giles, which features Mike Stobbie’s digital orchestra. They also feature on After All, a beautiful, wistful track which closes Anthology-The Studio Recordings Volume 1. It was penned by John with John Young, and features a reflective John at his soulful best. However, there’s much more than orchestral tracks on Arkangel. You Against and Emma. Both tracks show another side of John Wetton. Emma with its understated arrangement, is another Arkangel’s of highlights. It features John Wetton, as he continued to reinvent himself. After Arkangel, John Wetton released Chasing The Deer in 1998, and then No Mans Land in 1999. No tracks from these albums feature on Anthology-The Studio Recordings Volume 1. However, there’s seven tracks from John’s first album of the new millennia, Sinister. Sinister was released by John in 2001. It featured an all-star lineup. Robert Fripp, Ian McDonald, John Mitchell and Gary Chandler are among the guest artists. They play their part in what many regard as one of John Wetton’s finest solo albums. That’s not surprising given the lineup. The musicians that feature on Sinister are among some of the most talented of their generation. This includes prog rock royalty. Gone are the samples and synths, as John returns to his rock roots. That’s the case on tracks like Where Do We Go from Here? Another Twist of the Knife, Heart of Darkness and Say It Ain’t So all have a rocky sound. They bring back memories of the big, bold, anthemic sound that defined rock in the eighties and nineties. Second Best and Silently are dramatic, soul-baring ballads. John’s vocal is full of emotion as he lays bare his hurt. With its mixture of rock anthems and ballads, there was something for everyone on Sinister, where John Wetton and his all-star band roll back the years. Rock Of Faith was released by John Wetton in 2003. It was his first solo album since 2001s Sinister. However, Rock Of Faith was well worth the two year wait. When critics heard Rock Of Faith, they described the album as a fusion of classic, rock, prog rock and symphonic rock. For John, it was akin to a return to the seventies. What’s more it was a return to form for John Wetton. The ballad on Rock Of Faith are among the album’s highlights. This includes I’ve Come to Take You Home, which is a mixture of beauty and emotion. Then there’s the ethereal beauty that’s I Lay Down. Quite simply, it’s one of the highlights of Anthology-The Studio Recordings Volume 1. So is the spiritual sounding Who Will Light A Candle? Nothing’s Gonna Stand in Our Way is a hopeful sounding ballad. It’s a welcome inclusion on Anthology-The Studio Recordings Volume 1. Take Me to the Waterline. It has a much more rocky, progressive sound. Rock of Faith has an almost funky, dramatic sound, and shows just how versatile an artist John Wetton is. Seamlessly, John flits between ballads and rocky tracks on Rock Of Faith. In doing so, he combines musical genres, producing an album that’s beautiful, dramatic, soulful and wistful. John Wetton was maturing like a good wine, and would continue to do so. After the release of Rock Of Faith, John released Amata later in 2003. With John Wetton, it was a case of feast or famine. His fans hoped that after two albums in a year, there wasn’t going to a long wait for his next album. That wasn’t case. In 2004, John released Agenda. Just like Amata, no tracks from Agenda feature on Anthology-The Studio Recordings Volume 1. However, three tracks from John’s most recent album feature on 2011s Raised In Captivity. The last time we heard from John Wetton, was back in 2011. That’s when he released his most recent solo album, Raised In Captivity. Again, John’s joined by some of his musical friends. This includes guitarist Steve Hackett, formerly of Genesis and Asia keyboardist Geoff Downes. Former Deep Purple guitarist Steve Morse lays down some blistering licks on the uber rocky Lost for Words. It’s one of three tracks from 2011s Raised In Captivity that feature on Anthology-The Studio Recordings Volume 1. The others are the rocky Raised in Captivity and the folk-tinged ballad Steffi’s Ring. Again it showcases John Wetton’s versatility. Seamlessly, John Wetton switches between musical genres throughout Raised In Captivity. There’s never a dull moment, as John draws inspiration from his musical past. Elements of prog rock, classic rock and folk can be heard, as John and his musical friends play their part in a truly captivating album, Raised In Captivity. It’s a welcome addition to John Wetton’s discography. And what a discography it is. From his early days with Mogul Thrash, John Wetton seemed destined for musical greatness. After Mogul Thrash disbanded, John joined Family. That was a huge step for him. However, it was nothing compared to what came next. After releasing two albums with Family, John Wetton joined King Crimson. That was fitting. He was already an innovative musician. King Crimson were one of the most innovative groups of the prog rock era. With John’s help, their music moved in a different direction. John it seemed had the Midas touch. That proved to be the case. Having joined Uriah Heep in 1975, he played his part in their biggest selling album, Return To Fantasy. After Return To Fantasy, the wheels started to come off Uriah Heep. So, John Wetton reyurned to session work. Soon, John Wetton was working with the great and good of music had John’s number. He worked with Roxy Music, Brian Ferry, Tony Banks, Phil Manzanera, Roger Chapman and members of E.L.P., Genesis and Yes. It seemed John had an insatiable appetite for music. However, there was one thing John hadn’t done, released a solo album. So, in 1980, John embarked upon a solo career. Caught In The Crossfire, which was released in 1980, was John Wetton’s debut solo album. However, John’s solo career was put on hold when he joined Wishbone Ash for one album. With John playing bass, Wishbone Ash rolled back the years. It was a welcome return to form from the veteran group. However, John was just passing through. He formed Asia, whose 1982 eponymous debut album sold eight million copies. The followup sold another million copies. Astra was John’s final outing with Asia. By then, all wasn’t well within Asia. So, when Astra failed to replicate Asia’s first two albums, John called it a day. This allowed him to concentrate on collaboration and his solo albums. With John now a solo artist, he showed he was still an ambitious and innovative artist. He pushed musical boundaries, mixing musical genres and influences. Seamlessly, they morphed into something new, magical and often quite beautiful. Other times the music is dramatic, rocky and progressive. That’s the case throughout Anthology-The Studio Recordings Volume 1 which was recently released by Primary Purpose. It features tracks from five of John Wetton’s finest solo albums. This compilation is the perfection introduction to John Wetton’s solo career. Most people will be familiar with his work with Family, King Crimson, Uriah Heep and Asia. However, they make not have heard John Wetton’s solo albums. Anthology-The Studio Recordings Volume 1 is the perfect primer, and a welcome reminder of a true musical innovator’s four decade solo career.